More than 16,000 Miles; 98 Nights; 67 Motels/Hotels and a visit to almost all states. We have finalised our route! While 100 days of travelling is a lot, our initial list of places we wanted to visit was so massive that we couldn’t even fit half of it in our trip. Nonetheless we think that the current trip is a great combination of Culture and Nature; and of Tourist traps and off-the-beaten path gems. 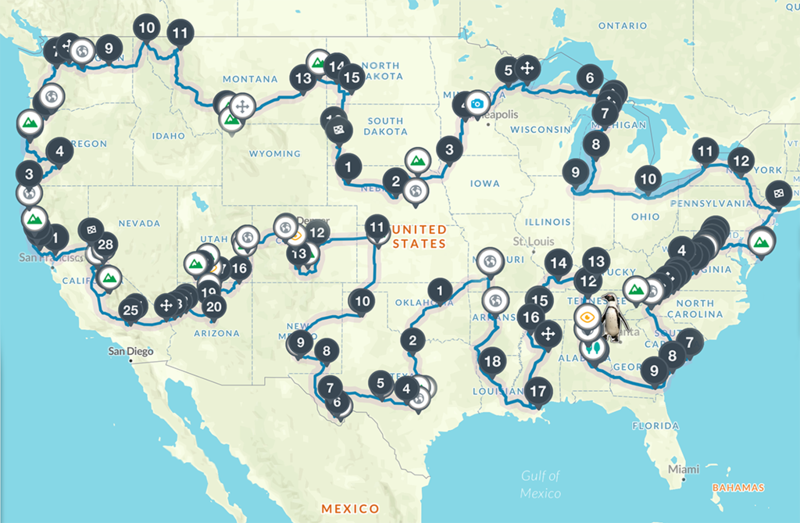 Of course we know that planning out the complete 100 day road trip isn’t very adventurous but, for what its worth, it at least allows us to not worry about “where to go” and “where to sleep”. Instead we can spend every minute of our day with actual sightseeing. Prachtig avontuur die jullie leven zal verrijken.